The “Tree of Life” permanent public art installation was conceived, designed, and produced by lead artist Sally Wern Comport in collaboration with ArtWalk, The Shelter Group, Hord Coplan Macht Archictecture, VisArts, and the City of Rockville to designate Brightview West End as a vibrant senior living community within the cultural hub of downtown Rockville. Harriet Tubman singing at the gate as she makes her first escape of many from a life of enslavement. 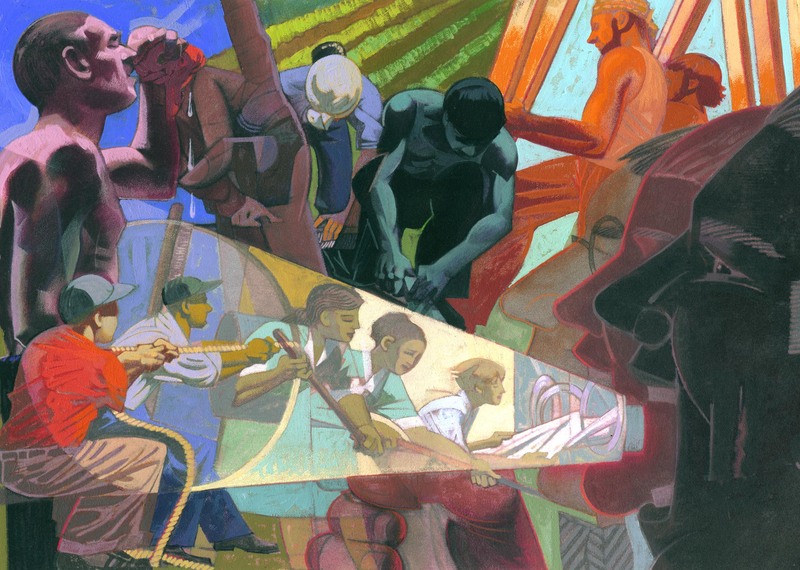 An illustrated mural for National Park Service Harriet Tubman Underground Railroad Visitor Center at Blackwater National Wildlife Refuge, Cambridge Maryland. Civil Rights Era activists marching across the Edmund Pettus Bridge in Selma, Alabama. 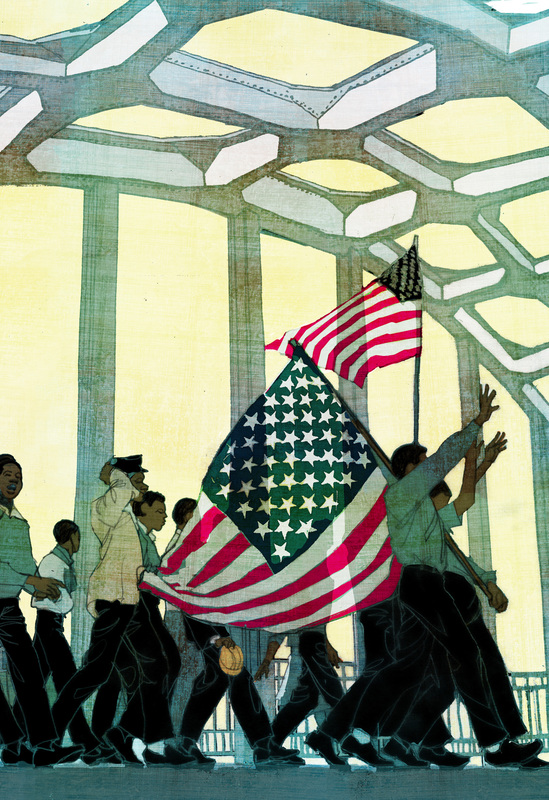 Illustration for "Dream March". "Tree of Life" at Brightview West End, Rockville MarylandNPS Harriet Tubman Visitor Center"Ada's Violin, The Story of the Recycled Orchestra of Paraguay"ArtWalk's Crosswalks: Tactical UrbanismZora & Me"Dream March: Dr. Martin Luther King, Jr. and the March on Washington"Industrial IllustrationElizabeth Seton High SchoolLight House Bistro"Love Will See You Through: Martin Luther King Jr.'s Six Guiding Beliefs (as told by his niece)"
The “Tree of Life” permanent public art installation was conceived, designed, and produced by lead artist Sally Wern Comport in collaboration with ArtWalk, The Shelter Group, Hord Coplan Macht Archictecture, VisArts, and the City of Rockville to designate Brightview West End as a vibrant senior living community within the cultural hub of downtown Rockville. 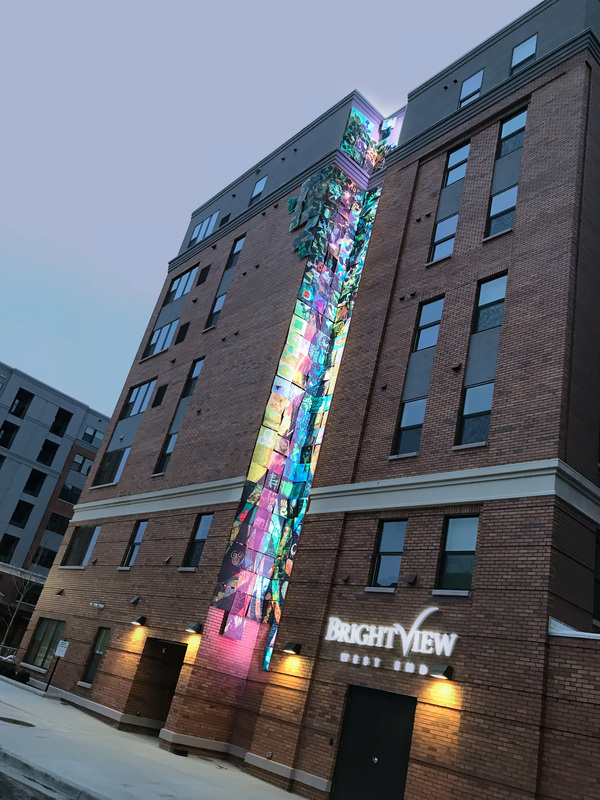 62 artists– local and international, young and old, professional and amateur, and many residents of Brightview communities up and down the Eastern U.S.– all contributed their hand and vision to the images texturizing the overall 6-story piece of art. 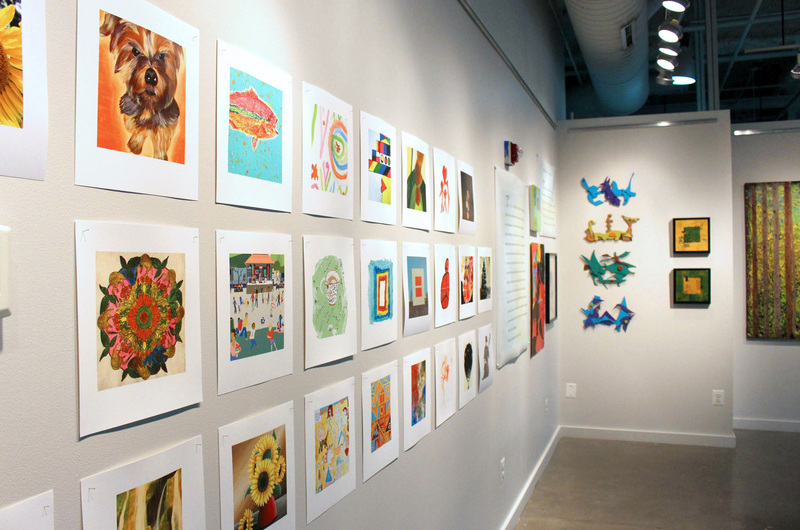 Like pieces stitched together in a quilt, the Art tells the larger story of the “Tree of Life,” given its richness of meaning from the many diverse, life-affirming, restorative symbols and scenes “stitched” throughout. The universal symbol of the tree is meant as a metaphor of the connectedness of the family of man and the seasons of life we share as a whole Community. 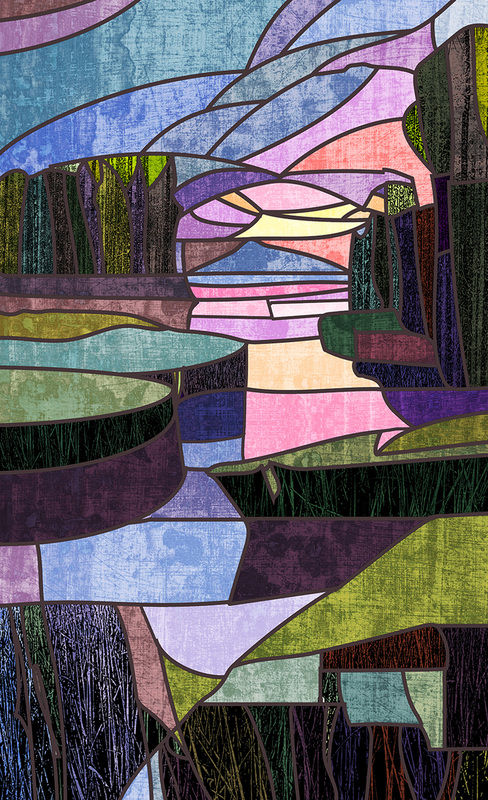 As part of the development of the "Tree of Life" artwork, Art at Large executed a call for entries with VisArts Rockville and all Brightview Senior Living facilities across the northeast to collect life-affirming imagery from artists of all backgrounds. 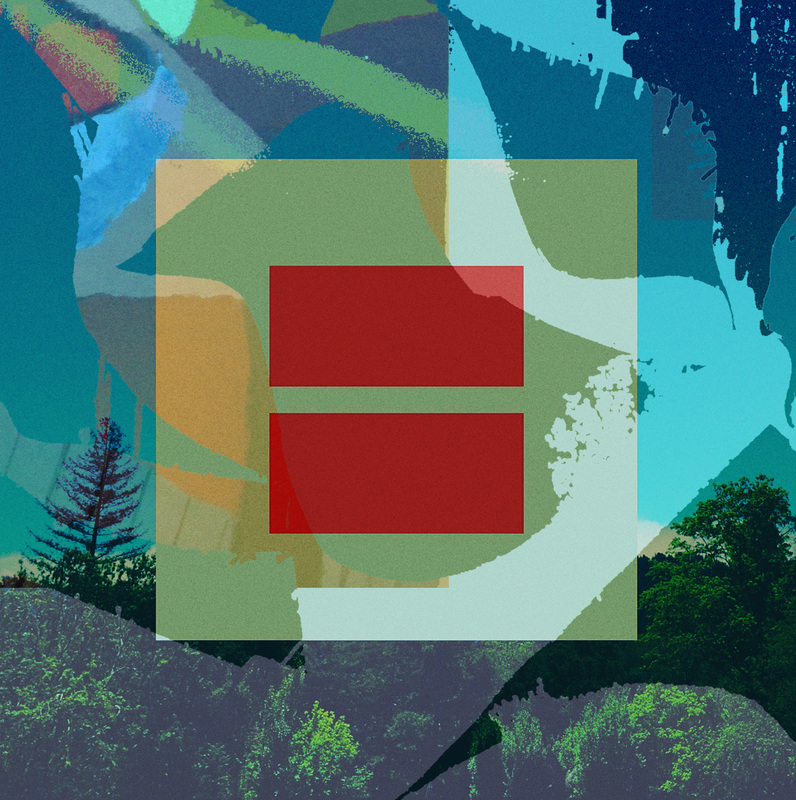 Comport concurrently juried the entries for inclusion in the final art piece, as well as curating and producing a gallery exhibition at VisArts to showcase the diversity of voices to be included. The Tree of Life is made up of 173 24-inch by 24-inch art panels, incorporating art produced by 62 artists of diverse backgrounds. The "Tree" is bejeweled with various symbols reflecting positive life-affirming imagery. 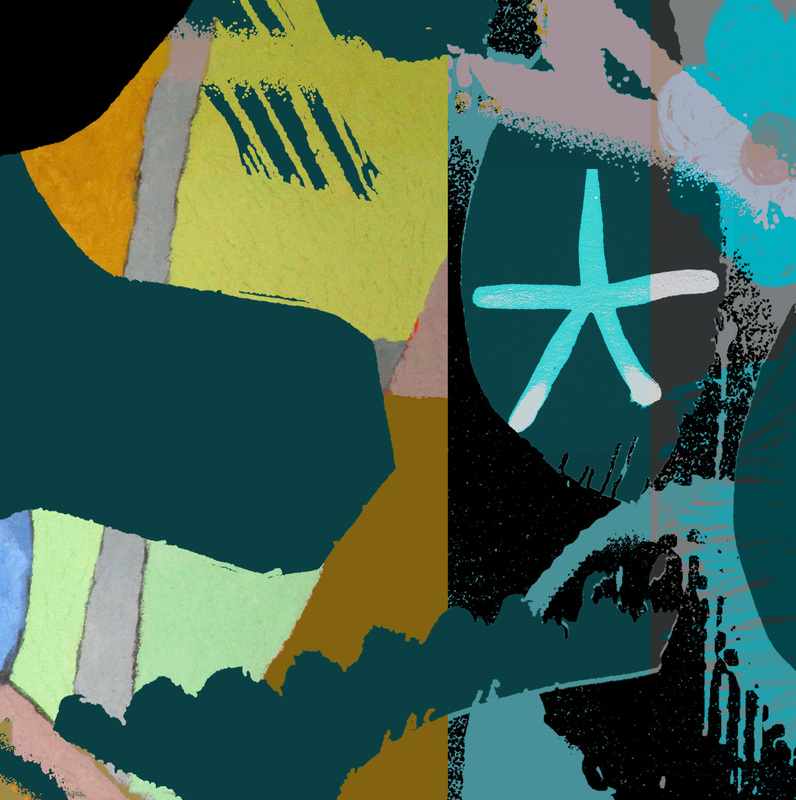 This detail shows one of the 173 art panels. The Tree of Life is made up of 173 24-inch by 24-inch art panels, incorporating art produced by 62 artists of diverse backgrounds. The "Tree" is bejeweled with various symbols reflecting positive life-affirming imagery. 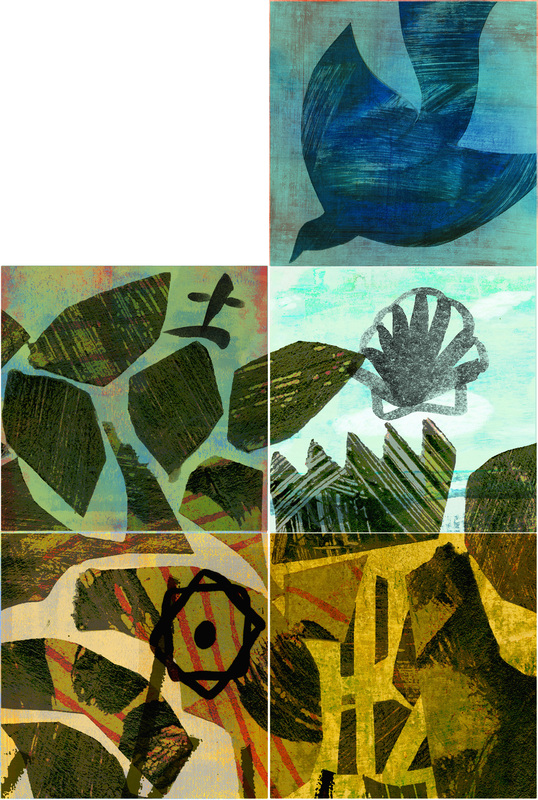 This detail shows a collection of 5 of the 173 art panels. 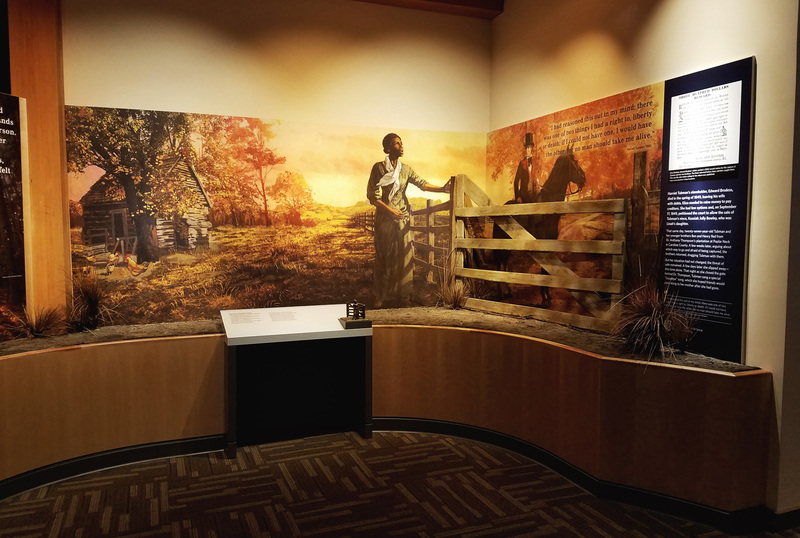 Sally Comport and Art at Large, Inc. worked with the National Park Service and Color-ad, inc. to develop custom illustrations for the Harriet Tubman Underground Railroad Visitor Center as mural backdrops for dimensional scenes illustrating key moments of Tubman's life. 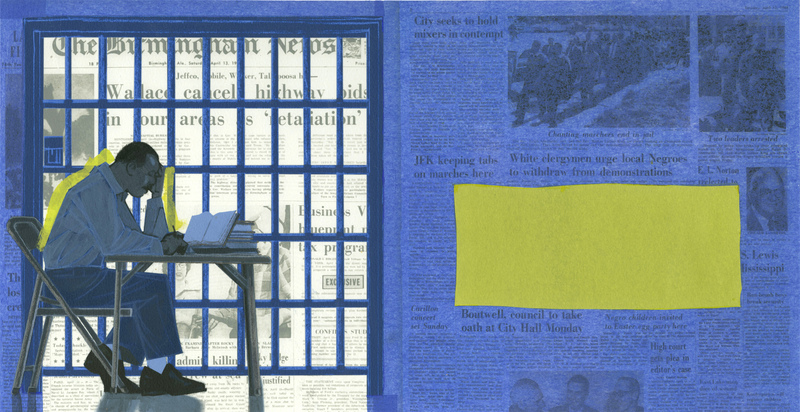 Comport's illustrations for the exhibition have been recognized by the Society of Illustrators Annual and Communication Arts Illustration Annual. 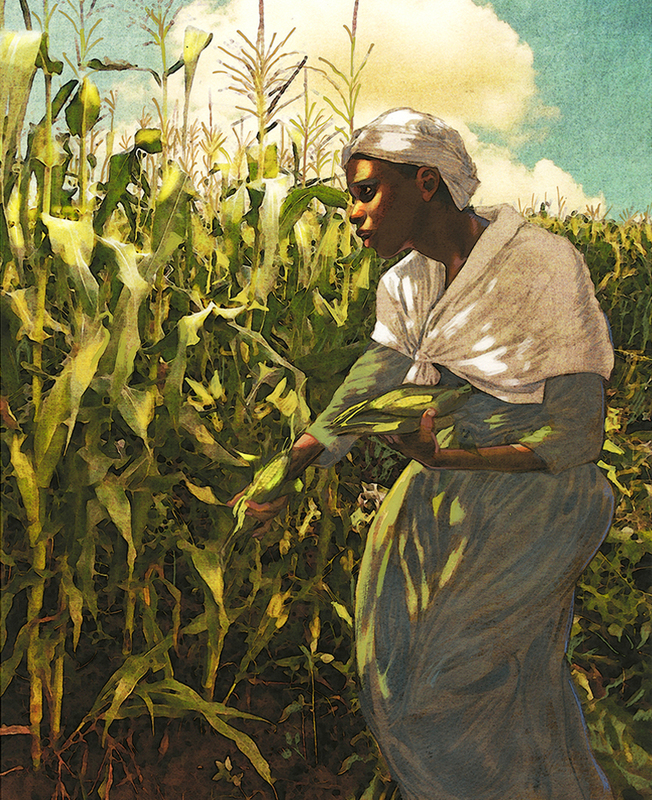 This image illustrates Tubman's resourcefulness and ability to survive in the elements as she forages for food. Exhibit View Detail. Harriet Tubman singing at the gate as she makes her first escape of many from a life of enslavement. 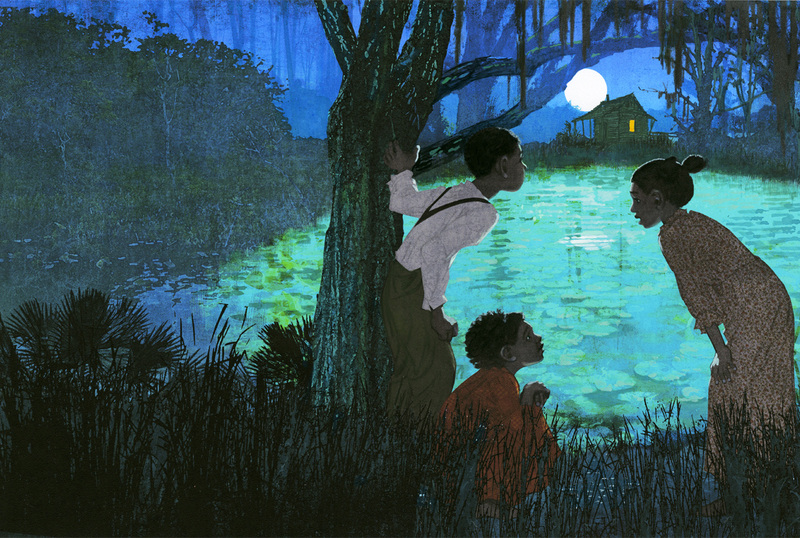 An illustrated mural for National Park Service Harriet Tubman Underground Railroad Visitor Center at Blackwater National Wildlife Refuge, Cambridge Maryland. 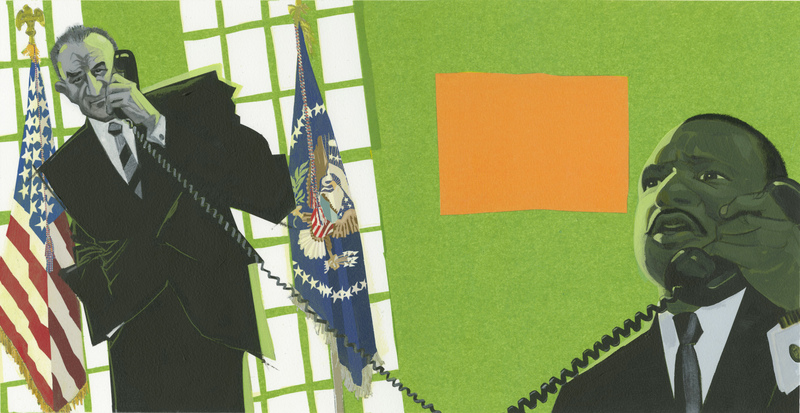 Illustrated backdrop of a chaotic scene from the Combahee River Raid, the first U.S. military operation to be led by a woman, Tubman. 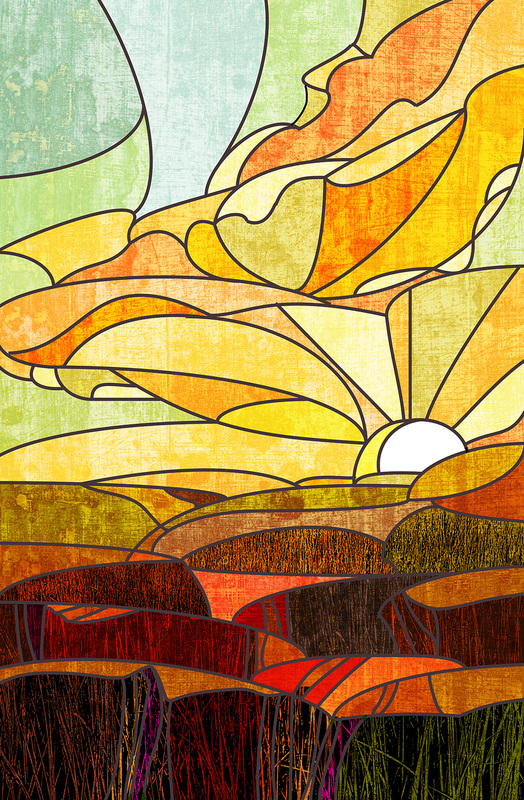 These back-lit stained-glass-esque images represented the seasons of Tubman's life and her oneness with nature as visitors exited the exhibition. 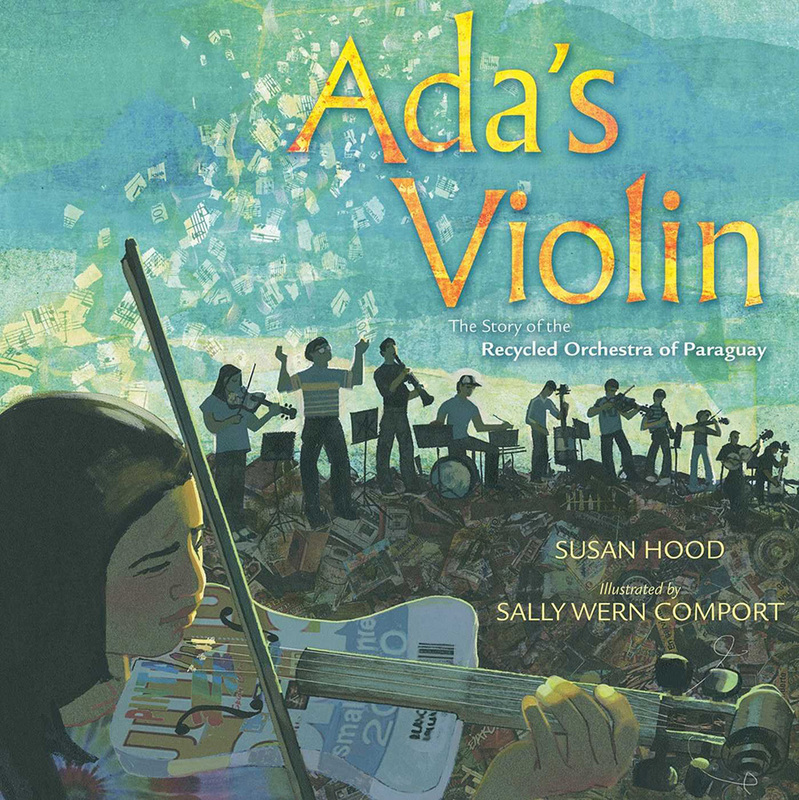 "Ada's Violin, The Story of the Recycled Orchestra of Paraguay"
From award-winning author Susan Hood and illustrator Sally Wern Comport comes the extraordinary true tale of the Recycled Orchestra of Paraguay, an orchestra made up of children playing instruments built from recycled trash. Ada Ríos grew up in Cateura, a small town in Paraguay built on a landfill. 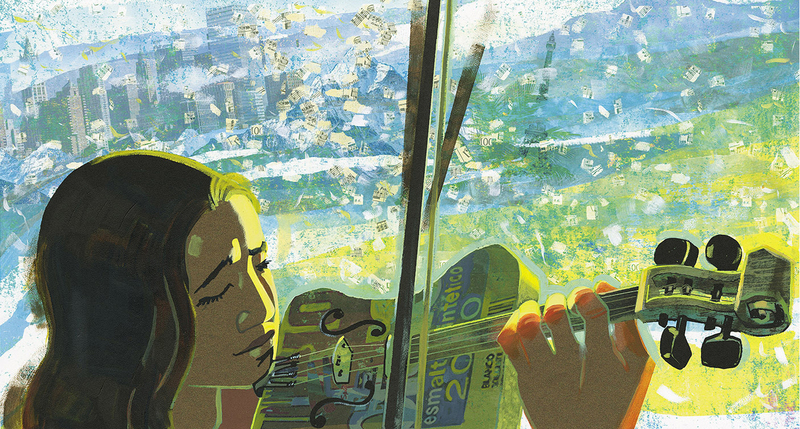 She dreamed of playing the violin, but with little money for anything but the bare essentials, it was never an option...until a music teacher named Favio Chávez arrived. He wanted to give the children of Cateura something special, so he made them instruments out of materials found in the trash. It was a crazy idea, but one that would leave Ada—and her town—forever changed. Now, the Recycled Orchestra plays venues around the world, spreading their message of hope and innovation. Comport employed collage and drawing techniques to capture the resilience and hope of the student musicians despite their difficult environment. 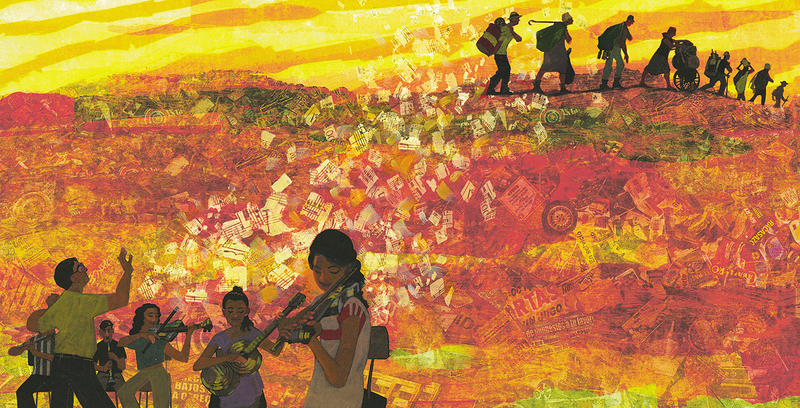 The sounds of the Recycled Orchestra carry through the town as the gancheros head home from a hard days work. 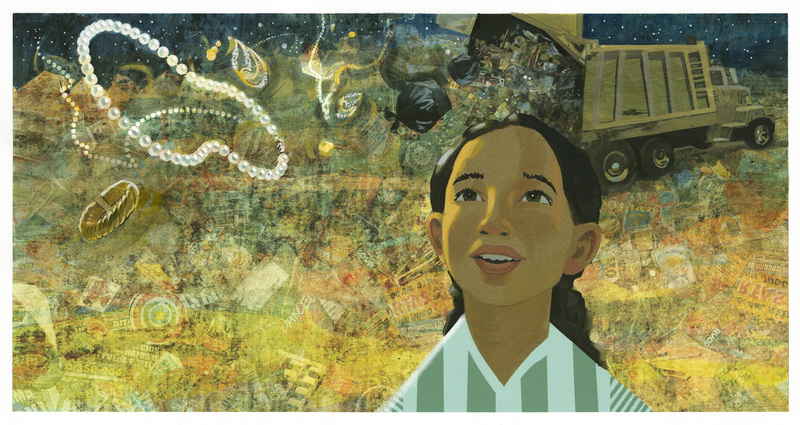 Ada of Cateura, a community built on a landfill, dreams of the treasures that could be hidden within the heap of trash. 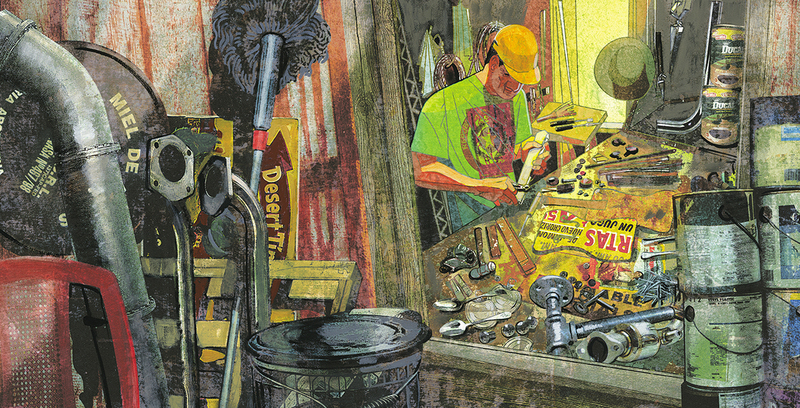 Cola, a ganchero and craftsman in town, tinkers in his shop to replicate the instruments with recycled materials. The Recycled Orchestra travels the world, performing for international audiences of massive scale. 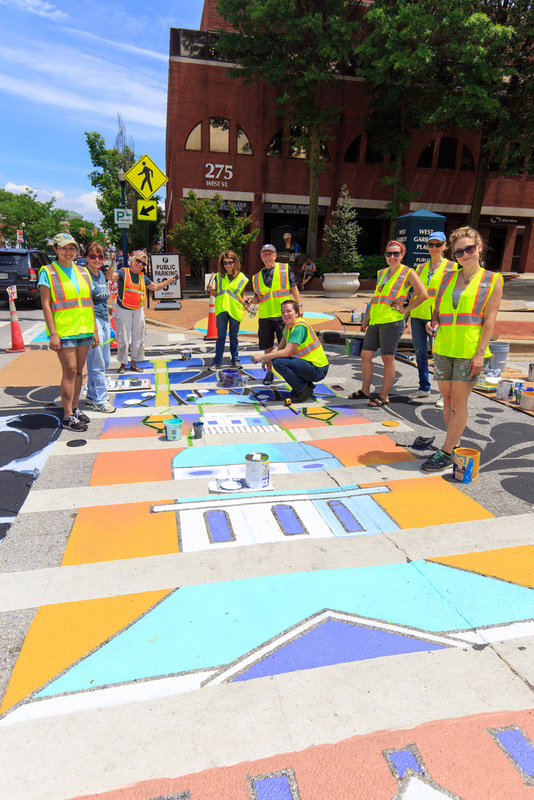 In collaboration with many entities throughout Annapolis, ArtWalk initiated the first in a series of artistically painted crosswalks to encourage walkability throughout the city. 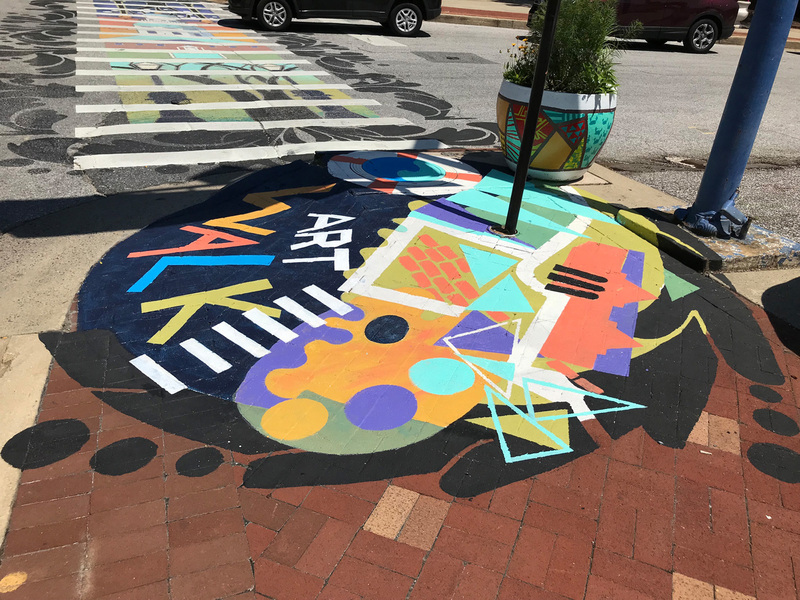 Starting at the gateway to the Arts District, this art installation brings motorists' attention to pedestrians crossing this busy intersection, while beautifying the neighborhood. 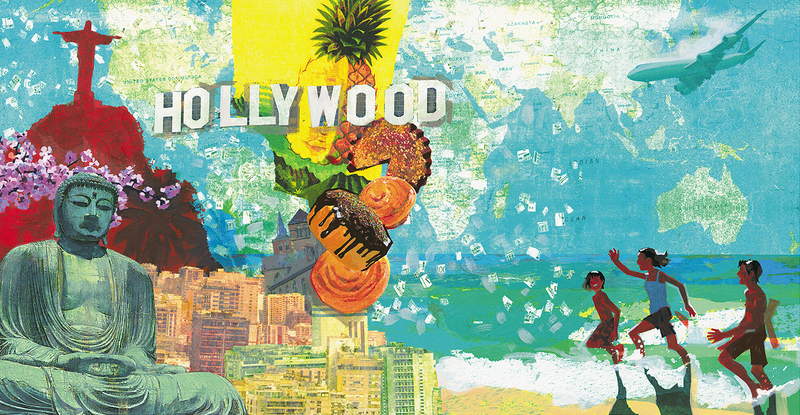 With creative input from the students of Studio 39, lead designer Sally Comport incorporated their concepts into a cohesive, vibrant piece while also spotlighting premier artists in the community. Patrice Drago of Maryland Hall, Charles Lawrance of FinArt, as well as Comport herself painted original designs within the entryway circles to the crossings. 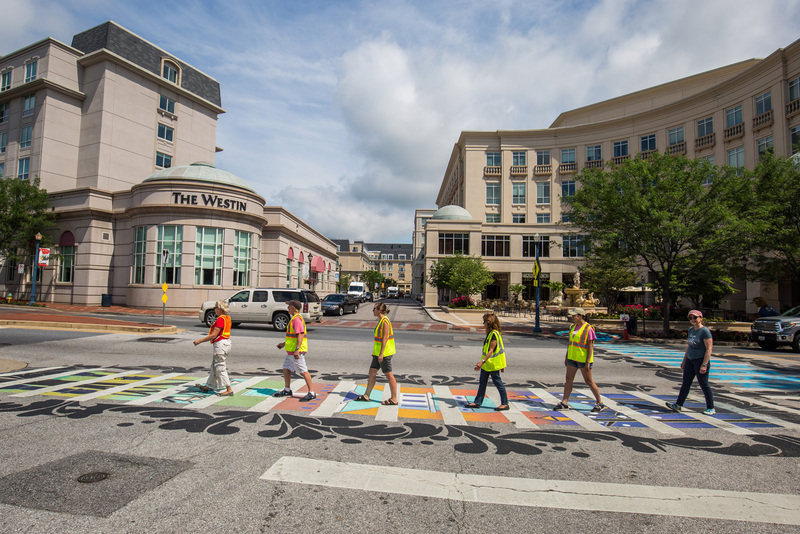 A team of artists lead by ArtWalk curator and Principal of Art at Large, Inc. Sally Wern Comport work collaboratively to execute the crosswalk design representing Annapolis, the first capital city of the U.S. 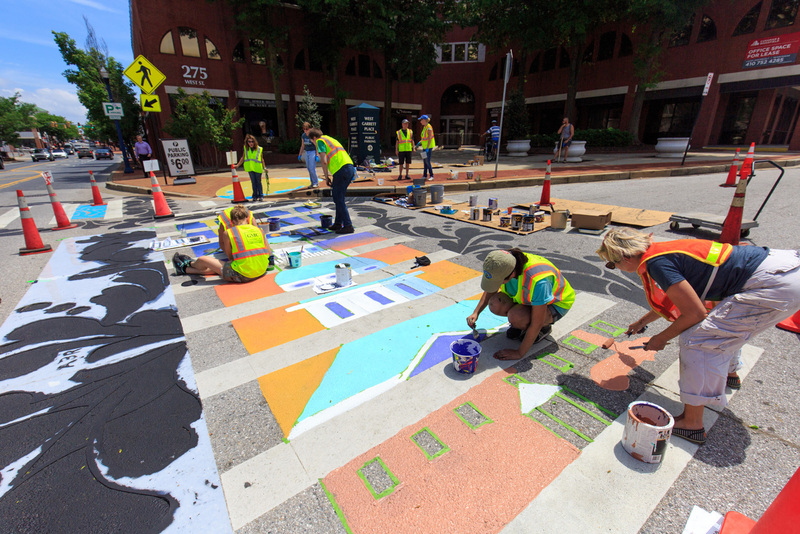 The crosswalk design incorporated three circular "canvasses" to designate the crosswalk points of entry, featuring works of local Arts District professionals. 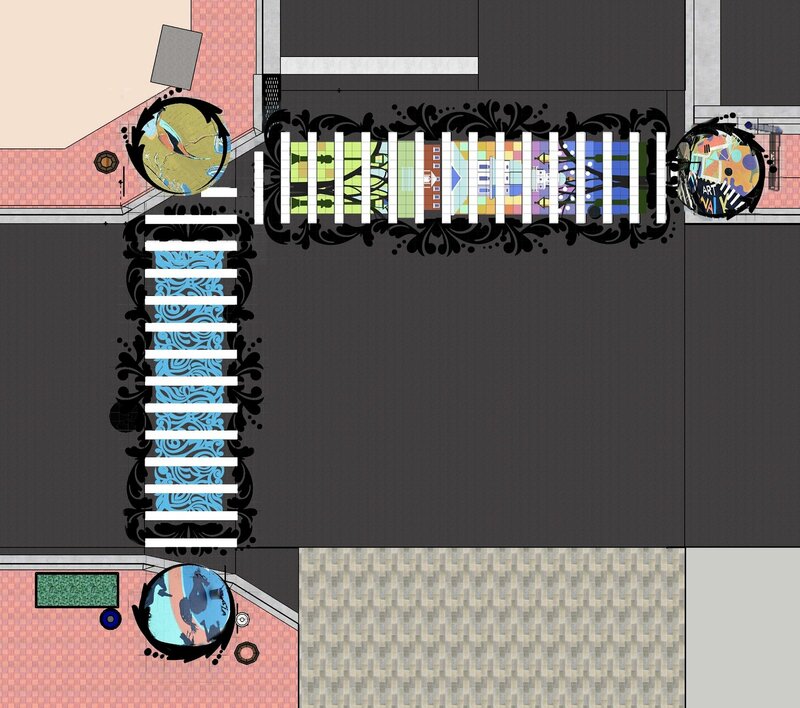 Sally Comport's abstracted map of the neighborhood is one of three designs. 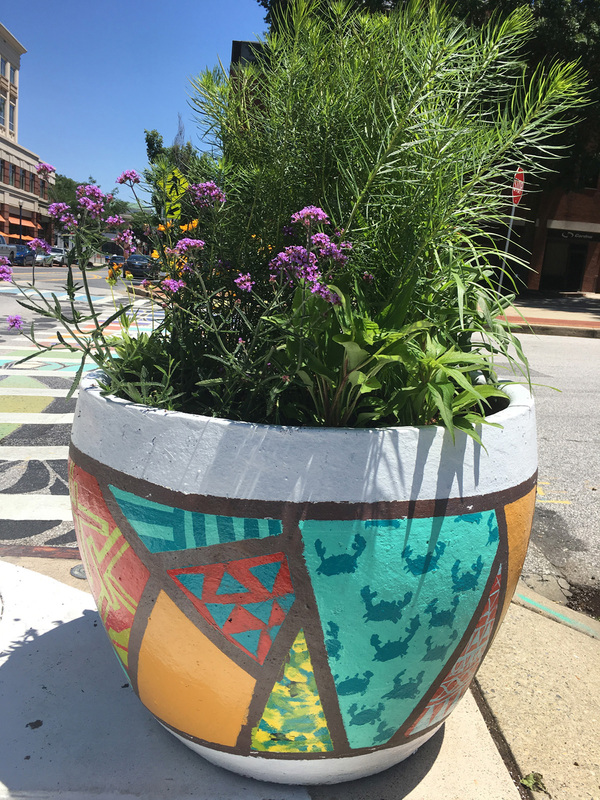 Comport's design for the art installation included flower pots painted by art students of Studio 39 at each of the three crosswalk entrances. Comport has received a gold medal from the Society of Illustrators for "Zora & Me: The Cursed Ground". 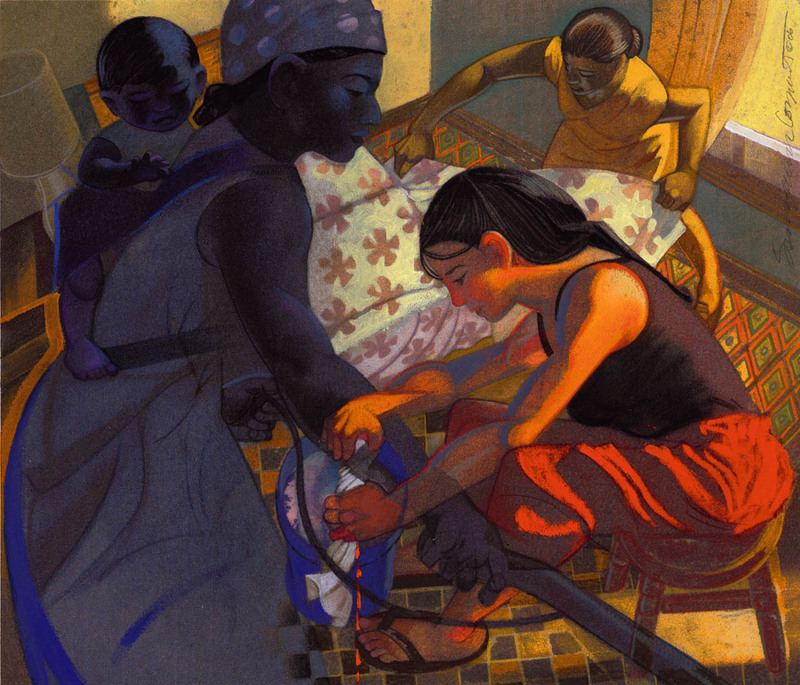 Comport has received a gold medal from the Society of Illustrators for "Zora & Me: The Cursed Ground". About Zora & Me: A powerful fictionalized account of Zora Neale Hurston’s childhood adventures explores the idea of collective memory and the lingering effects of slavery. “History ain’t in a book, especially when it comes to folks like us. 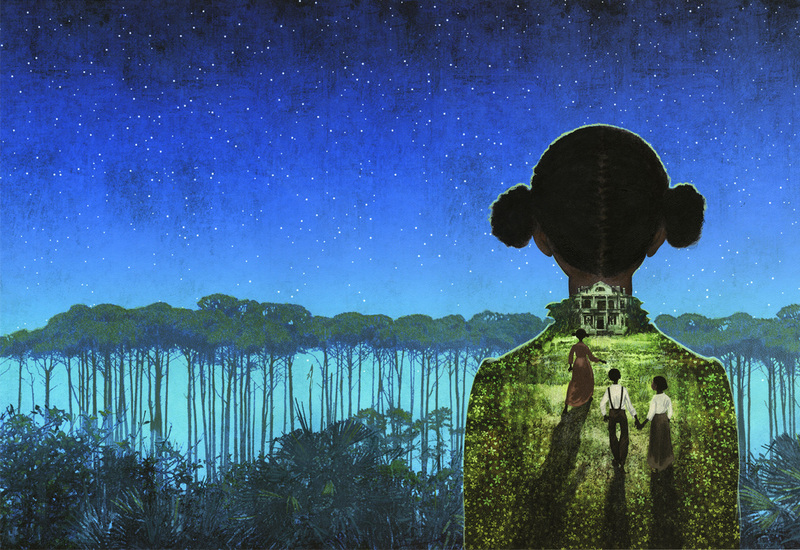 Racial duplicity threatens an idyllic African American community in the turn-of-the-century South in a dazzling debut inspired by the early life of Zora Neale Hurston. Whether she’s telling the truth or stretching it, Zora Neale Hurston is a riveting storyteller. Her latest creation is a shape-shifting gator man who lurks in the marshes, waiting to steal human souls. 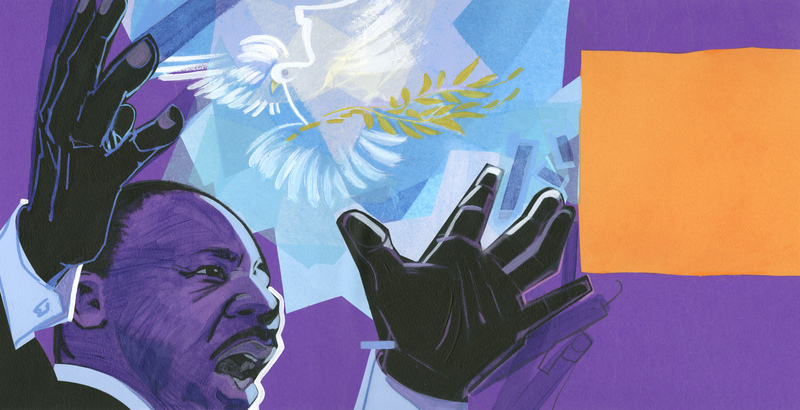 "Dream March: Dr. Martin Luther King, Jr. and the March on Washington"
Comport has been recognized by the Society of Illustrators and Communication Arts for the Edmund Pettus Bridge illustration from "Dream March." 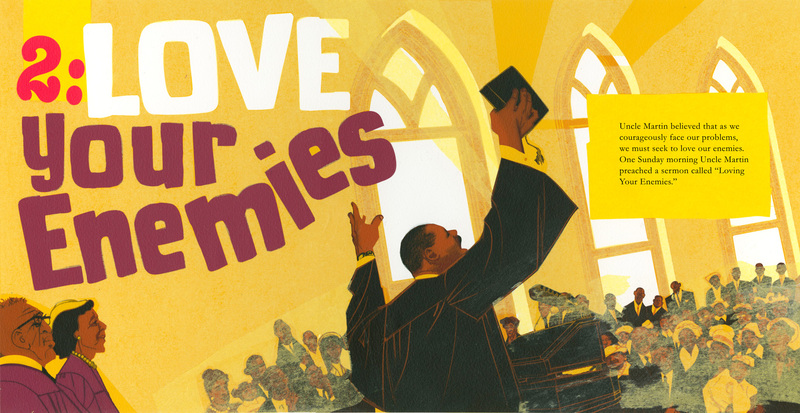 An inspiring biography introducing children to the civil rights movement, Dr. Martin Luther King, Jr., and the historic march on Washington. 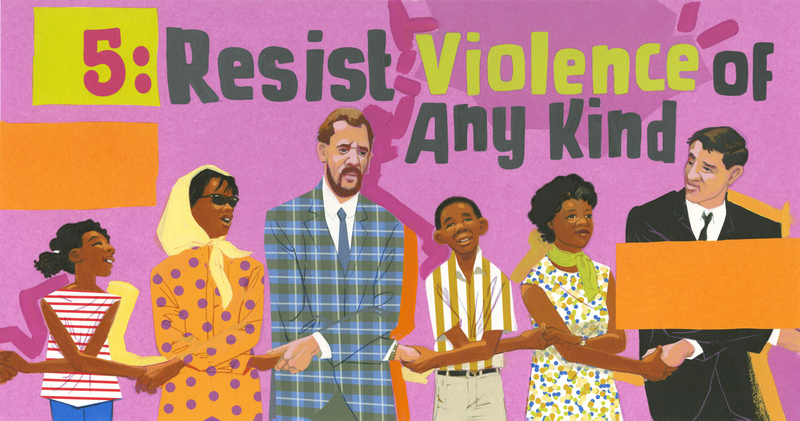 Young readers can now learn about one of the greatest civil rights leaders of all time, Dr. Martin Luther King, Jr., in this Level 3 Step into Reading Biography Reader. 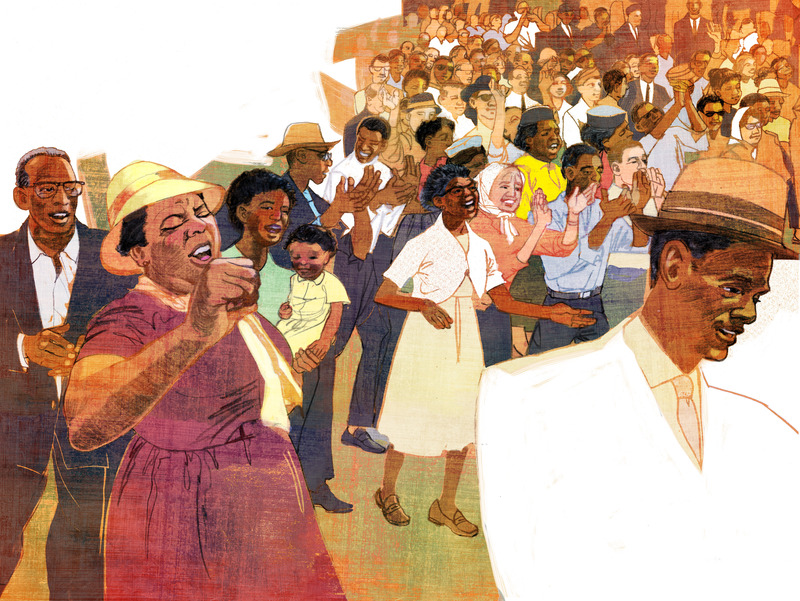 Set against Dr. King’s historic march on Washington in the summer of 1963, a moving story and powerful illustrations combine to illuminate not only one of America’s most celebrated leaders, but also one of America’s most celebrated moments. 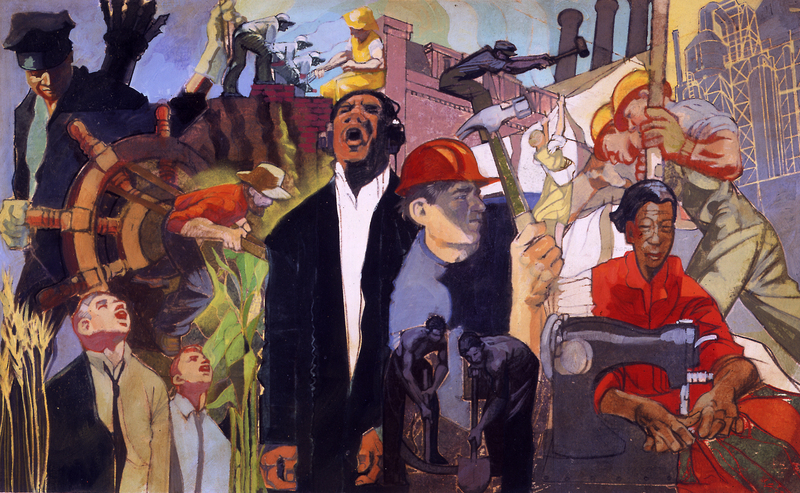 Comport has made a name for herself in illustration for her WPA-style figurative depictions of workers in various industries. 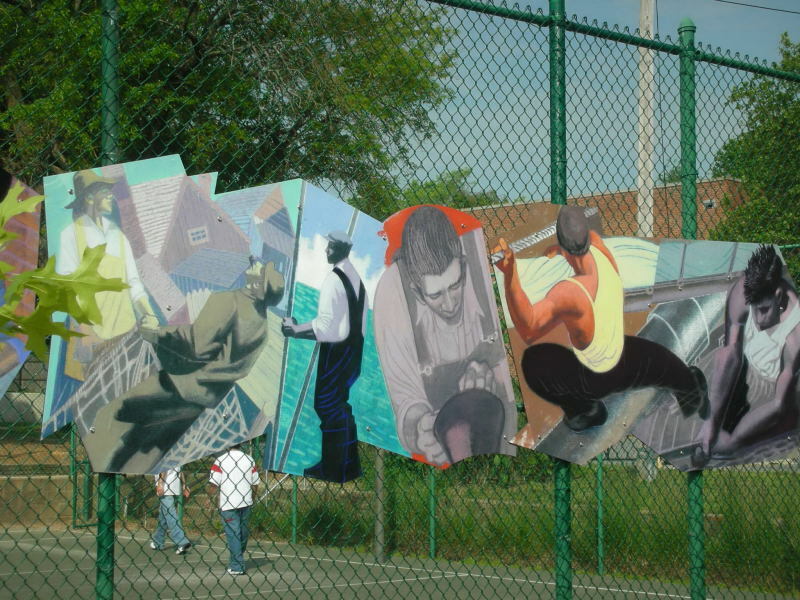 As part of ArtWalk's citywide Annapolis Charter 300 project, Comport installed this illustration as a public art piece representing Annapolis's industrial history. 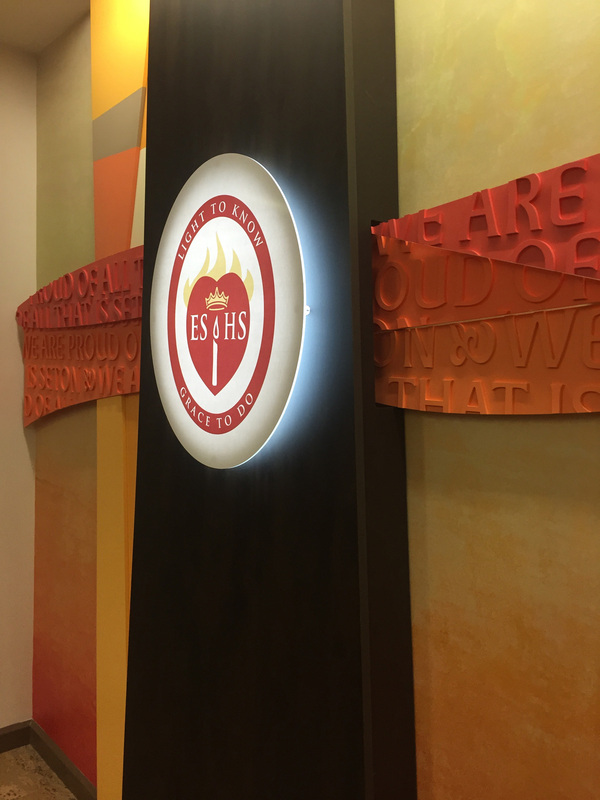 Comport and Art at Large, inc. worked with Elizabeth Seton High School to design and produce several art installations for a renovated library space that reflected the school's mission and values. 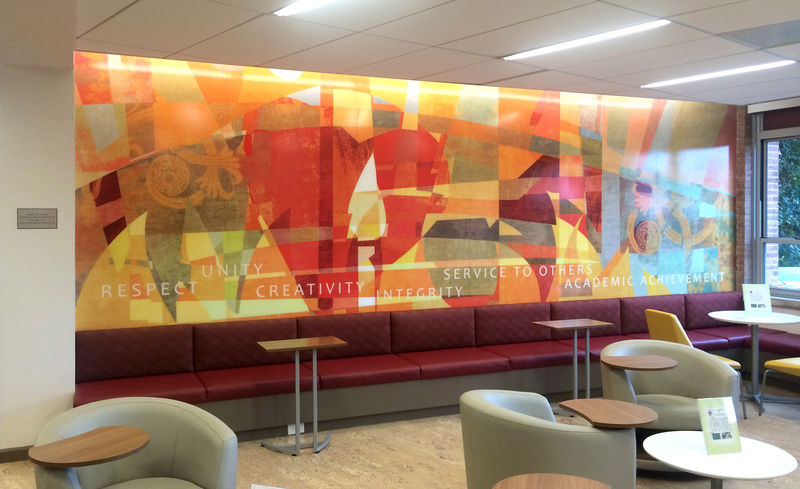 A view of the Seton value wall installed in the renovated library's lounge area. A deconstructed representation of the school logo and a statement of values was designed for the library's feature wall. 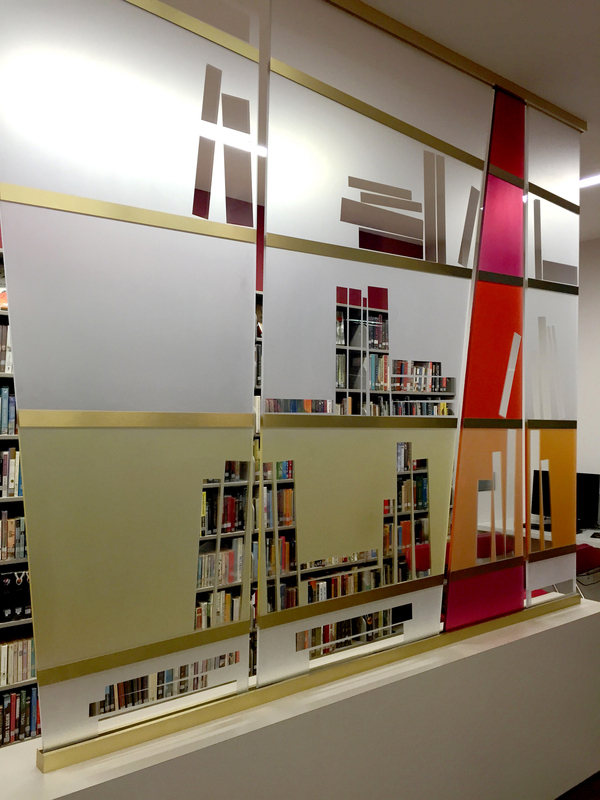 Comport utilized various glass treatments to design a divider wall for the library environment. 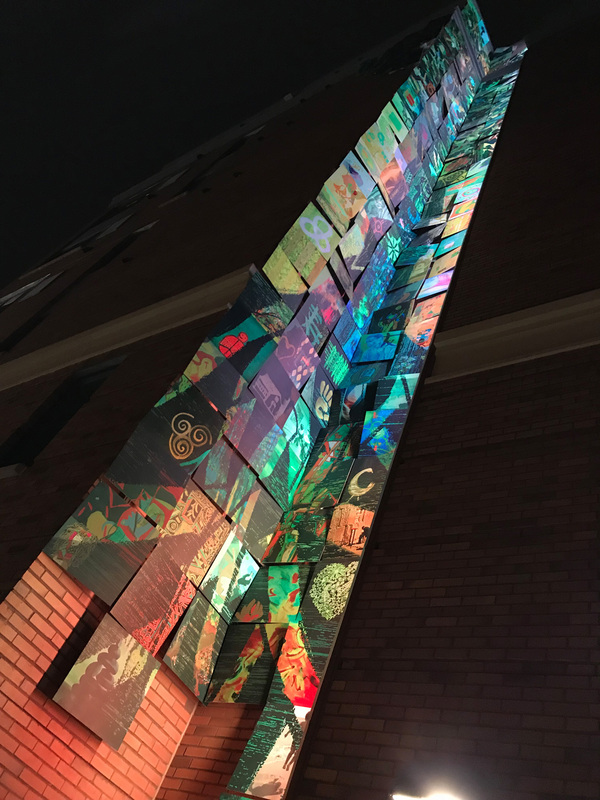 The library entrance was enhanced with an illuminated installation representing the Seton identity and value statements. 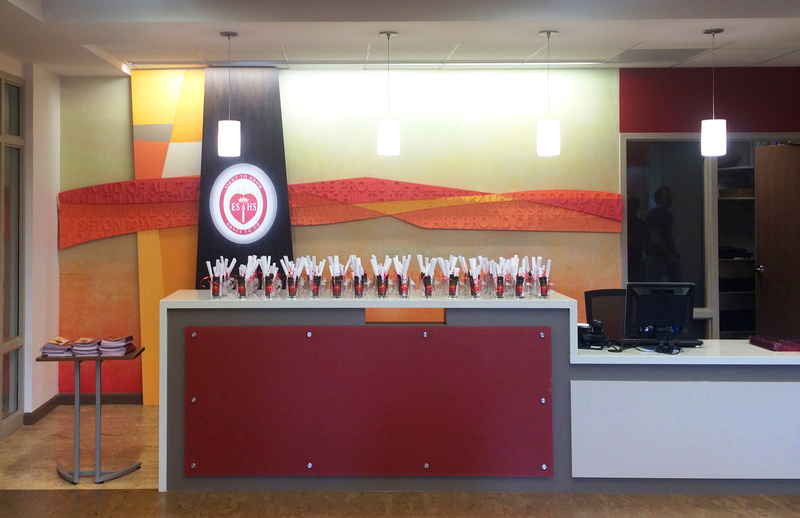 Comport designed and produced a donor recognition wall for the school to honor its gift-giving community. 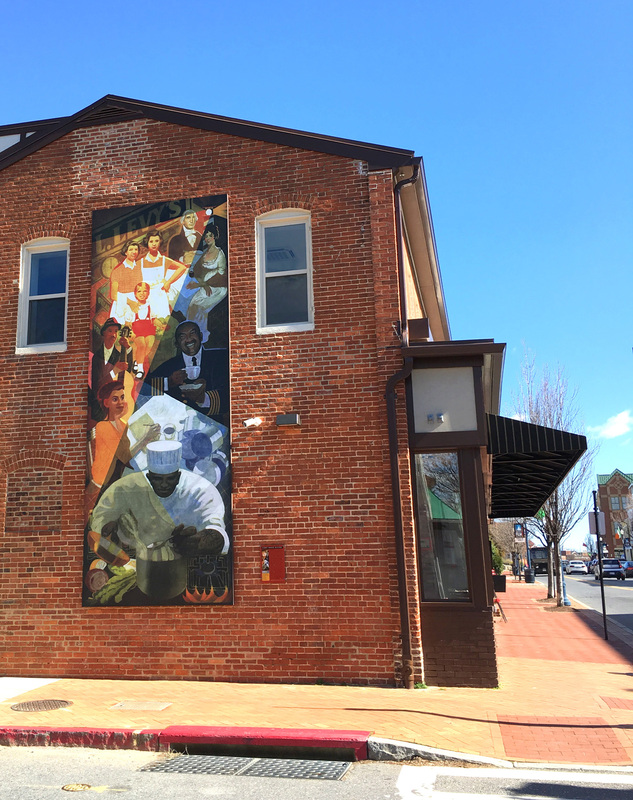 In conjunction with the opening of the social enterprise restaurant, Light House Bistro, Sally Wern Comport illustrated and produced a custom illustration with ArtWalk to grace the Bistro's corner facade. 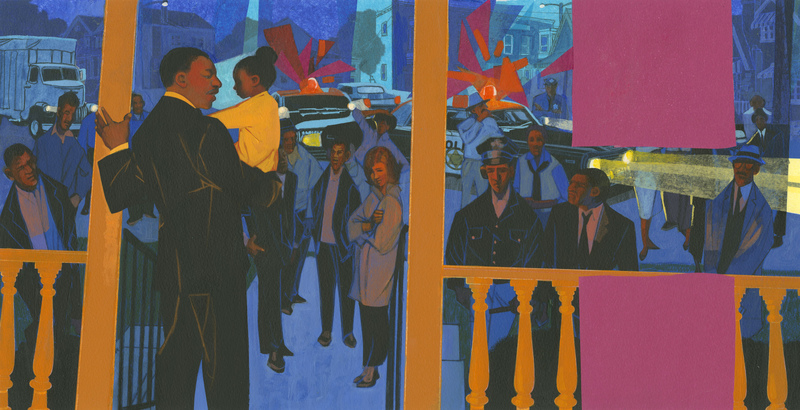 The illustration is a visual history of the building, landmarking its placement in the Presidents Hill neighborhood, its former usage as a woman-owned family grocer in the early 20th Century, its location in the Annapolis Arts District, and its current service of the Bistro's mission: to provide culinary arts job training in tandem with Light House Shelter & Homeless Prevention Services. 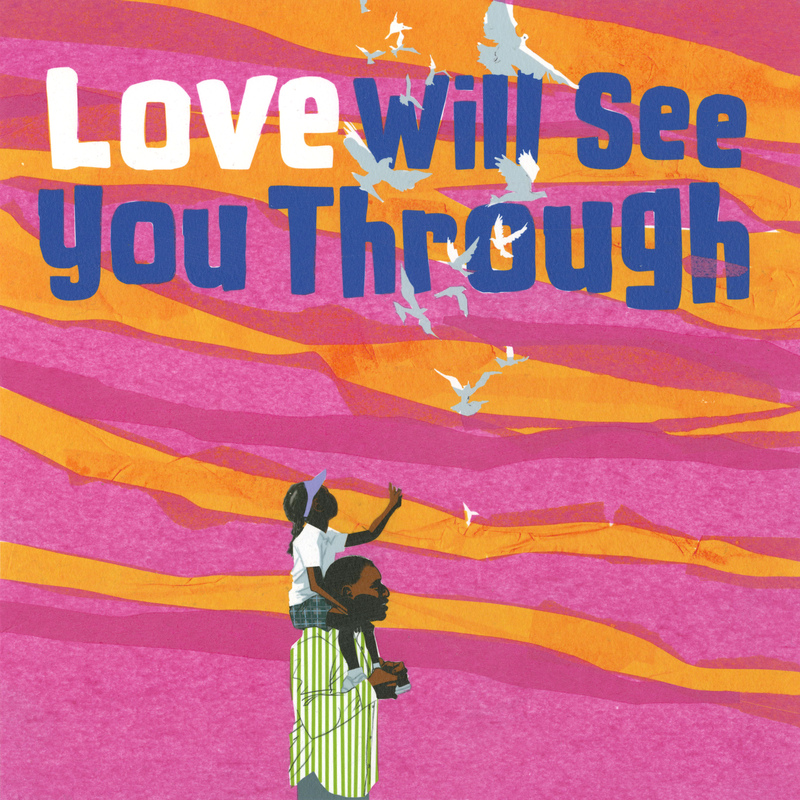 "Love Will See You Through: Martin Luther King Jr.'s Six Guiding Beliefs (as told by his niece)"
The niece of Martin Luther King, Jr. reveals six timeless and universal principles that encompass the civil rights leader’s greatest legacy: Love will see you through. 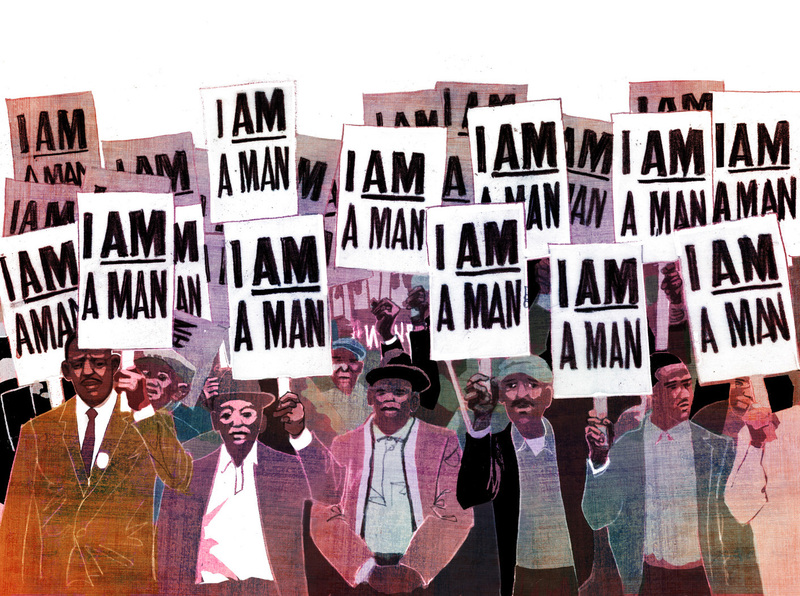 Growing up as the niece of Martin Luther King Jr., Angela Farris Watkins witnessed firsthand the principles and values that “Uncle M.L.” practiced and lived by throughout his fight for equality. Drawing from experiences and episodes both personal and well-known, Dr. Watkins artfully details the guiding beliefs of one of the greatest men in history. 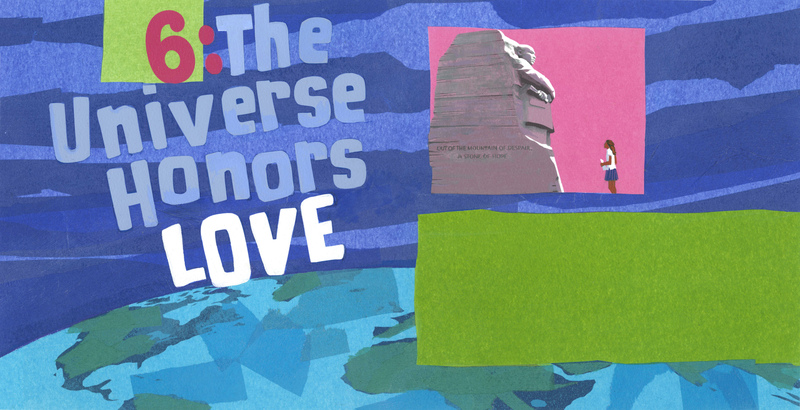 Including “have courage” and “love your enemies,” these six hallmarks of virtue and nonviolence reinforce the truth that “the universe honors love” and will inspire readers of all ages.